Inside, and outside, the Ghetto. While most people (rightfully) identify Italy as a Catholic country, its capital city, Rome, actually lays claim to the oldest Jewish population in Europe. The first Jews likely arrived as messengers sent by Judah Maccabee in the second century B.C.E. Jews have continued to live in Rome ever since–sometimes thriving, but more often enduring hardship as Christianity established itself as the world’s dominant (and sometimes domineering) religion, and cataclysms like the Spanish Inquisition violently disrupted European Jewish existence. Throughout the centuries, however, no single historical period has been more defining to Rome’s Jewish community than the 315 years–from 1555 to 1870–that it spent inside the Ghetto. 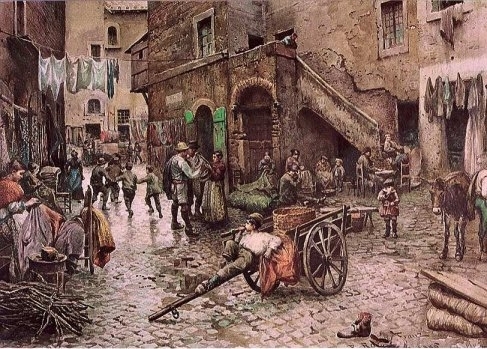 Approximately 2,000-3,000 Jews lived in Rome in 1555, when Pope Paul IV established the walled Ghetto. A significant number of those Jews had recently moved from the South of Italy (where, because of the impacts of the Inquisition on Spanish-ruled Sicily and Calabria, they were no longer welcome). Overwhelmed by the influx of Jews, whom he viewed as second-class citizens, Pope Paul IV decided to segregate the community. The Jews in the Ghetto lived in incredible poverty and cramped conditions, which only grew worse as their population grew. (The community was somewhere between 7,000-9,000 strong by the time the Ghetto walls were finally opened in 1870.) Additionally, the land on which the Ghetto was built–seven marshy, flood-prone acres that backed up directly against the Tiber River–was some of the least desirable in the city. 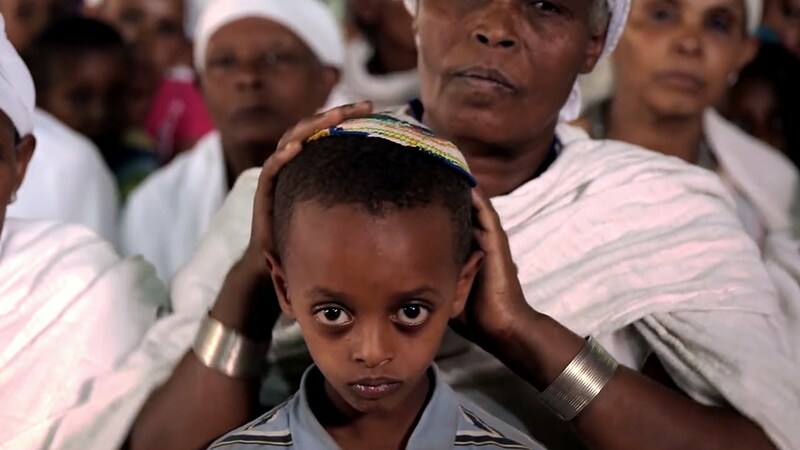 Jews were technically allowed to leave during daylight hours, but outside the Ghetto they had to wear clothing that identified their religion–yellow hats adorned with bells and a horn for men, and two blue stripes across the chest (the same mark donned by prostitutes) for women. Like in other countries, Jewish men were largely restricted to two types of work–money lending and peddling clothes. Jewish women spent many long days together making clothes, while their husbands left for the day These women became adept at fabric recycling–turning old dresses and bits of cloth into beautiful new designs, including majestic covers for the community’s Torahs. All Jews were required to attend the Catholic churches that flanked the Ghetto on all sides. Some Jews protested silently by stuffing wax and bread in their ears to muffle the words of the sermons. To add insult to injury, the Jews in the Ghetto were only allowed to have one synagogue–an impossibility for a diverse community that included both indigenous Roman Jews (called “Italkim”) and newcomer Sephardic Jews from multiple communities to the South. To solve this predicament, the small synagogue structure secretly housed five different congregations. The Pope assumed that one or two generations in these conditions would be enough to convince the Jews to convert. Though there were individual Jews who converted to Christianity, on the whole confinement in the Ghetto tended to reinforce, rather than fragment, Jewish life. The Ghetto walls allowed the Jews to practice their religion in relative safety, encouraged the formation of tight community bonds and, ironically, allowed distinct Roman Jewish culture and customs to develop and flourish. Tragedy would, of course, strike in Rome once again during World War II when 2,000 of the city’s approximately 7,000 Jews were sent to Nazi concentration camps, where the vast majority were killed. And in 1982, a small group of Palestinian militants attacked the Great Synagogue, killing a 2-year-old boy and injuring others. Despite these horrors, however, most of the 20th and early 21st centuries have proven drastically kinder to Rome’s Jews. Naturally, after the Ghetto walls were torn down, a large portion of the community (the ones who could afford to) fled the immediate area for other neighborhoods. Today, only 400-800 of Rome’s 16,000 Jews live in the Ghetto (the area still goes by this name). Like other historically Jewish immigrant enclaves (e.g. New York City’s Lower East Side and Mile End in Montreal), the Ghetto has recently become the center of mass gentrification. Today, its streets are lined with restaurants and art galleries, and apartments regularly sell for over a million Euro. Ironically, this economic shift has placed some of the most coveted real estate in the hands of the same families who were too poor to leave it behind. Visiting tourists (Jewish and not) have also helped breathe new life into the area. Guidebooks point to the Ghetto as one of Rome’s lesser-known gems, and, because of Jews’ long history there, one of the most “authentically Roman” places to visit. “When I first started giving tours of Jewish Rome in 2002, nobody came,” Pavoncello said. Now her guided walks regularly sell out. Despite the Jewish community’s dispersal to other neighborhoods, the Ghetto continues to serve as a primary gathering place. Every day around lunchtime, the street fills with hundreds of students spilling out of the K-12 Jewish day school that is housed in a refurbished building in the Ghetto neighborhood. Nearby benches are lined with community elders who discuss the day’s news, and on Saturday nights, young adults head to one of the Ghetto’s kosher fast food joints.